This powerful but light-hearted look at money management really turns on some bargain basement ideas that will both surprise and encourage you. Even if you think you’re doing all right now, there are ideas and strategies that can make things simpler, more effective, and improve your overall financial situation. eBook available from Smashwords or your favourite online store..
WHOLESALE ORDERS page. The usual discounts apply. A budget is a system of planning where your money is going. It is a fluid plan, changing and evolving constantly. It need not be restrictive and not allow for fun in your life. Indeed, we all need some fun and need to allow for it in our budget. How much you allow depends on where you want to go, how fast you want to get there and how much you are prepared to change. It also needs to take into account your age and what investments and the like you have in place. A good financial advisor or financial planner may help here. What your financial structure looks like and what you want to achieve, coupled with how much you are prepared to change, will shape what you can do. Different people want different things. Also, at varying ages our needs are totally different. A teenager (usually) just wants a car where as a married couple may be looking to buy their first home. Then the children come along and lives change. A couple whose children have left the nest may be looking towards a holiday, or to get the last bit of the mortgage paid, leaving them debt free. This is something most people strive for and budgeting is a tool to help you reach this point. It’s important to note here that change happens anyway - life has a habit of doing that. Change is the only constant in our lives. Voluntary, controlled and appropriate change can enhance your outcome dramatically, helping to put you in control to achieve what you want. A household is actually a business. It has money coming in and money going out. It would be a great goal to have the least amount of money going out as possible and the most amount of money coming in. You are accountable to various companies for your electricity, phones, gas etc. so you have to be in control of your finances and your paperwork. Otherwise, you can get into a huge mess and it could end up costing you more. It has for some people I know. They had to pay an account (again) that they had already paid because they could not prove they had paid it, as they had lost the receipt. A budget is just one way of helping to control your financial life. 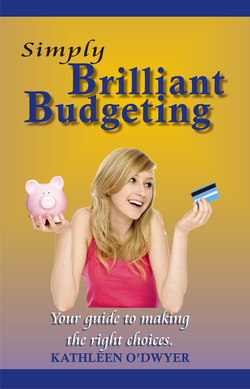 Getting your thinking right is necessary before even contemplating making a budget and I know this small but concise book will help point you in the right direction.